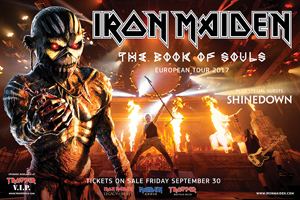 IRON MAIDEN are about to return to European arenas with their 2016 magnum opus, The Book Of Souls. The tour kicks off at the Sportpalais in Antwerp, Belgium before the British heavy metal icons play four shows in Germany, followed by dates in Ireland and the UK. Due to the huge demand, an additional show was scheduled in Oberhausen, Germany for 25 April. KNAC.COM will be doing a show review from Oberhausen, Germany on 24 April.